My love for jars in the home continues:) I have several in the work room and in my kitchen, and just added these to my inspiration list. How was your weekend? Mine went a little too fast as always. Hubby and I had a fun date night Friday and saw the movie True Grit. Have you seen it? What did you think? I actually really enjoyed it. The characters were fantastic. Oh, and I cannot forget-there are a few bloggers I want to thank! Thank you Charlotta for the fabulous award on her lovely blog, Space for Inspiration. Thank you to my new chum Glocal Girl for including me in her list of 7 blogs she <3. You ladies make me smile! Mine went too fast too and Oh my gosh I love those jars!! These jars are gorgeous! I need a collection of them to keep my little baking supplies in -- like cupcake papers and chocolate chips. And I haven't seen True Grit yet, but I really want to -- it looks so good. Maybe this weekend. Love jars! Found some really cute ones for Claire's party !! I love soaps in my jars. SO pretty! those are some beautiful jars! i didn't get to see true grit, glad to hear it's worth the time! i have heard true grit is a good one. might have to check that out soon. love the photos too - those jars are perfect! Just picked up some jars over the weekend - can never have enough. glad you had a great weekend! Such a great idea, I have a lot of these around the apartment and they make such a huge difference! love these jars. i love how there's so many shapes and sizes. Aww, you're welcome! 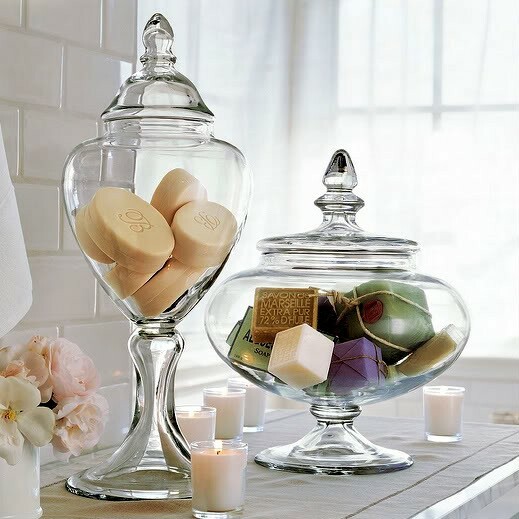 and what pretty jars you have... never thought of utilizing them with soaps like that. a new home decorating idea! so simple with such a fantastic aesthetic effect. nice! I've always loved jars filled with candies or other treats. However, I have none in my home! Why? Because I'd eat it all! I am so in love with apothecary jars!! I love the inspiration you found and would love to have some in my future bathroom like in the above photo...full of pretty soaps!! Eeee! my highschool boyfriends mom was a dentist and she had 3 big pretty glass jars like this filled with tooth paste, brushes and dental floss in her bathroom. i always thought it was a cute-cheeky way to decorate! Apothecary jar really do make everything look better! I love the idea of filling one with cupcake liners. Heaven knows I have enough of those floating around my kitchen. So crazy! I was just thinking that I loooved these jars but that no one had really blogged them! And here you are bloggin about them!! You read my mind! I love apothecary jars - those little baking cups look so cute! You're a popular gal - I've passed along the Stylish Blogger Award to you on my blog today too! I too love love jars! I don't have my own home yet, but I'm sure I'll have jars in every room too! I was actually thinking I wanted one of those jars myself, for storing and displaying small baked goods :) Its like you read my mind. I haven't seen True Grit yet, but I hope to soon. I love these jars! I was thinking about getting some for my dog and cat food instead of having ugly plastic bins on my counters...bad, I know! 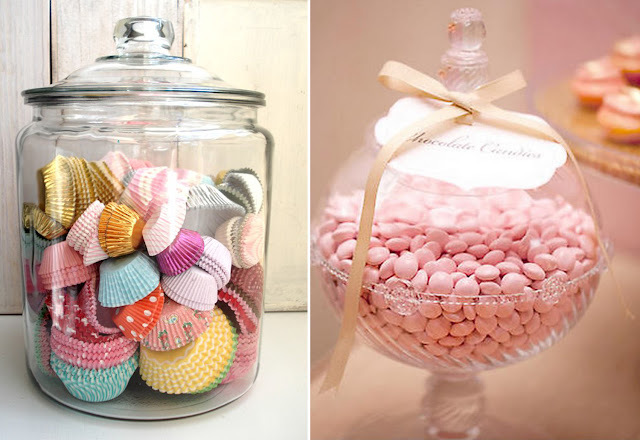 I love this, pretty jars can turn even the simplest of household items into a lovely decoration. i love apothecary jars for everyday uses. they make any space feel instantly personal. I love apothecary jars... I keep q-tips and cotton balls in them! i always look for clear jars when i'm browsing my local thrift store. i just love beeing able to see pretty things stored in there! i am in love with the apoth. jar with the cupcake liners in it! clever and beautiful! thanks for sharing these! Love this post. I just purchased a really great one from TJ Maxx for a steal. Nice lines and had a tassel hanging from the neck. I filled mine with wine corks but I am loving the soaps. I also love those jars in the house. I have one which is full of stars (I made these origami stars and put all of them inside the jar). Everybody loves it when sees it here. I loved the idea of the candy papers in it too!